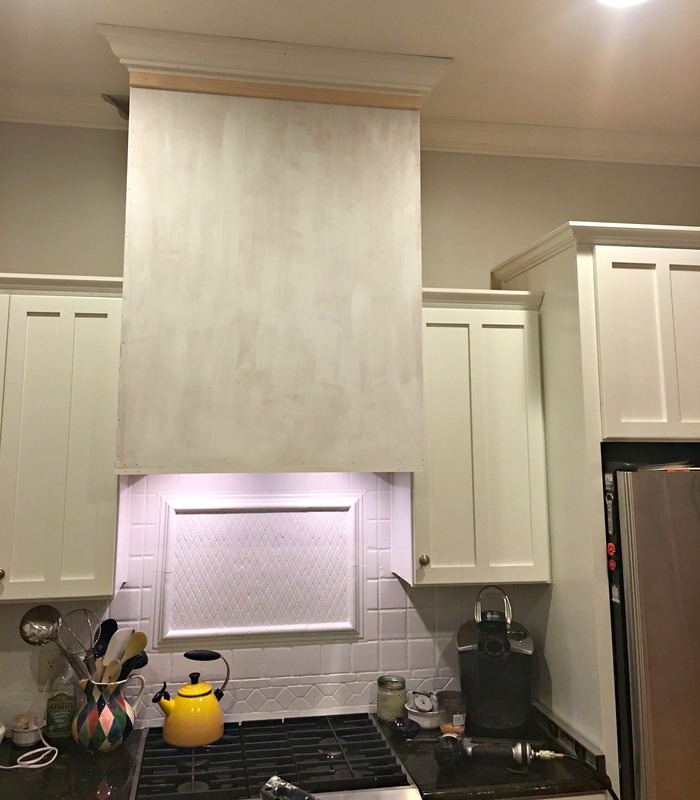 I am so happy to be able to write this post about our new kitchen hood. 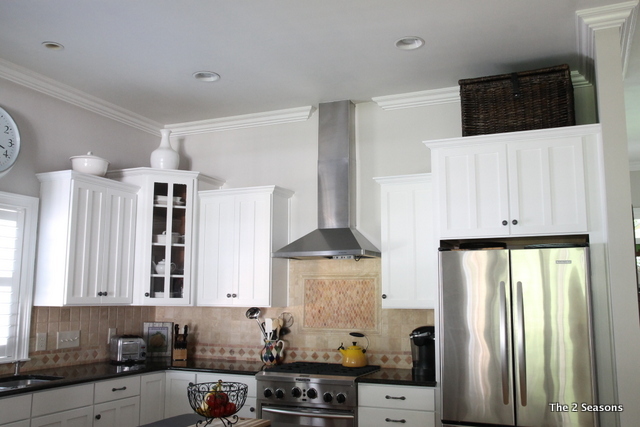 To give you the back story, we never had any issue with our kitchen fan and the way it looked. I liked it, and it was already much fancier than the one in our last house. Apparently, it had issues with us, though. After about a month after we moved into our house, the fan stopped working. We had a repair man check it out, and he said it was dead and that the time had come to order a new one. 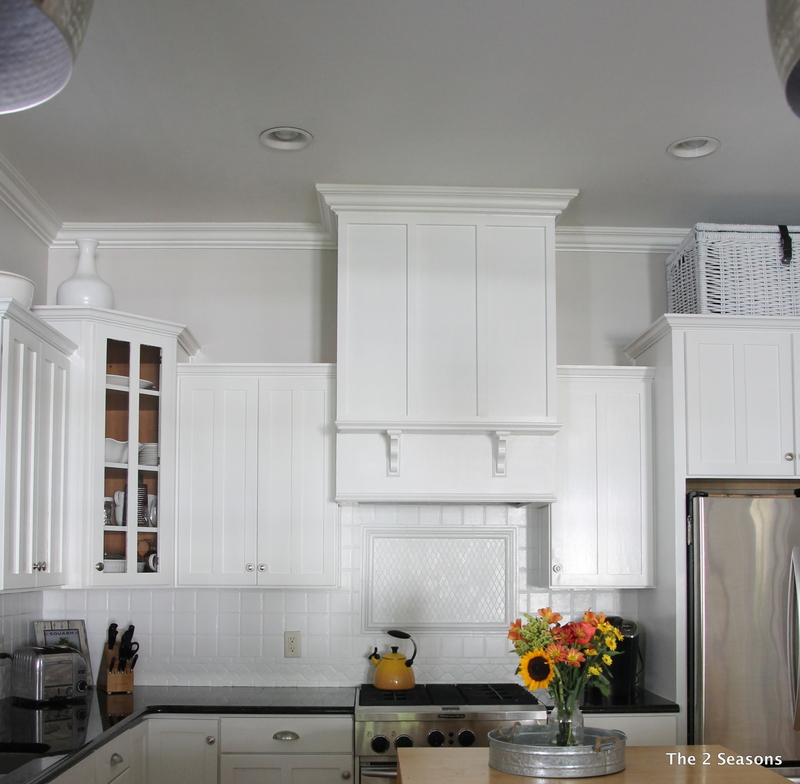 One thing we did notice after living in our house was the molding was not centered with the hood. On the right of the hood it appeared that they ran out of molding, and it always looked a little “off.” We then started looking at hoods and were shocked by the prices. So, we decided to buy a hood insert and build our own custom hood. 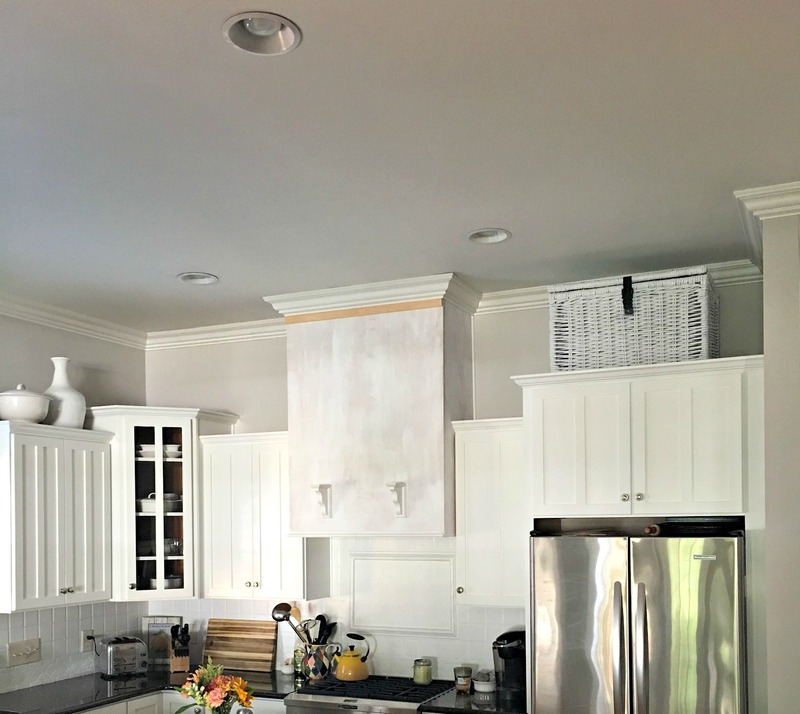 It turns out that even after buying the insert and the supplies, we saved hundreds of dollars, and we ended up with a new custom hood that we LOVE. Overall, Yankee didn’t think the project was too hard other than the little details. The toughest part was the molding and trying to reposition it on our tall ceilings. It was hard to do in places even with a ladder. Here the crown molding is back up, and that really started to add the finishing look. We wanted to add a little shelf to the hood. Or I should say, I wanted to add a shelf so I could decorate it. 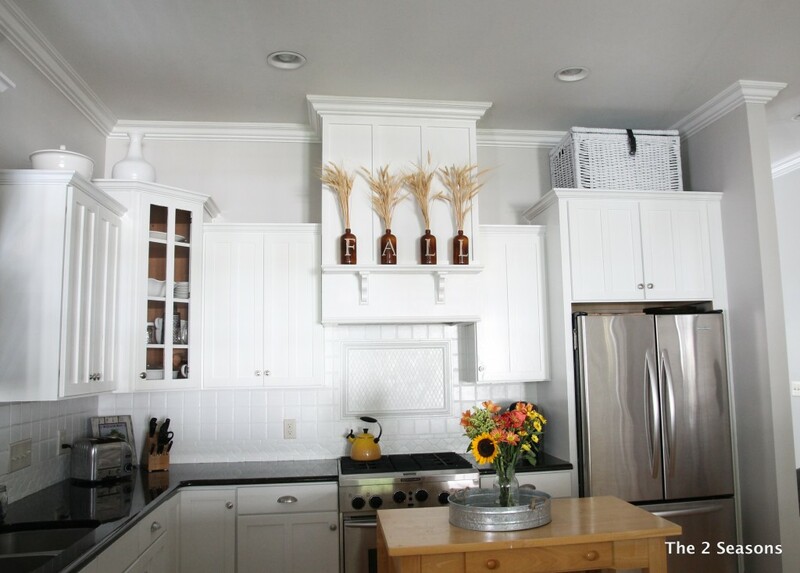 We also thought corbels would be a nice addition. Once the shelf and final details were up, then it was my time to really get to work and paint. It is amazing how much we can get done during nap times on the week-ends. It is so fresh and airy, and I just love the look. I also love that our house has a working fan now. After a few days of not having anything on the mantel, I relocated the FALL bottles from the dining room fall decor to the mantel, and I think they are perfect for fall. You also get a sneak peak of our new island. Since we took these photos, it has gotten its update. You get to see it soon. Well, there you have it…. another update to our kitchen. I love seeing how our kitchen has evolved with really not doing that much other than some paint and a little construction. It now feels more us. I just love it, and the important thing is to love your home. We are hosting Thanksgiving this year, and this room will be getting quite the work-out. 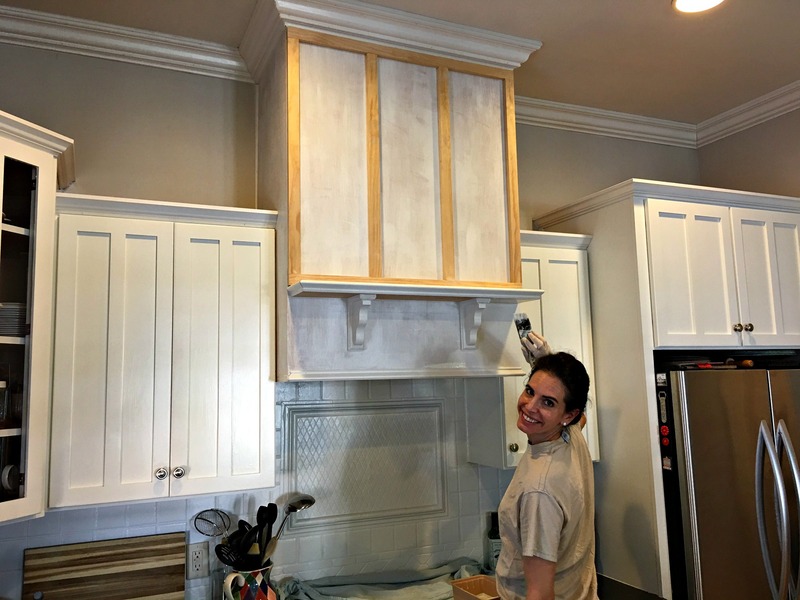 Thanks for reading and following along in our little kitchen update process. Next up will be a closer look at our new kitchen island. 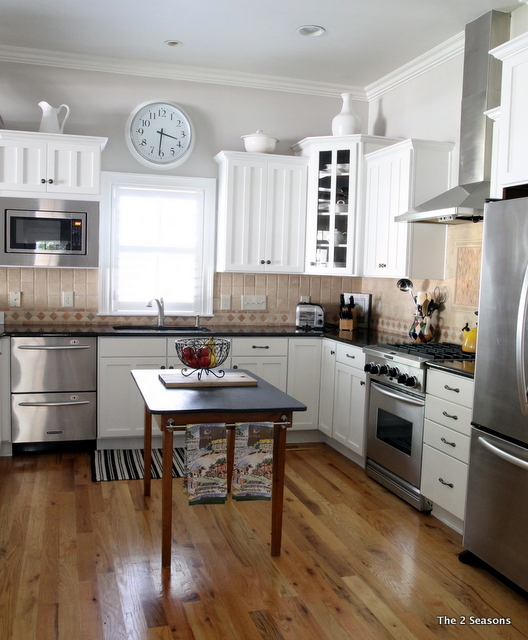 The kitchen in our Dutch colonial is about 1/2 finished, which is sort of driving me crazy. 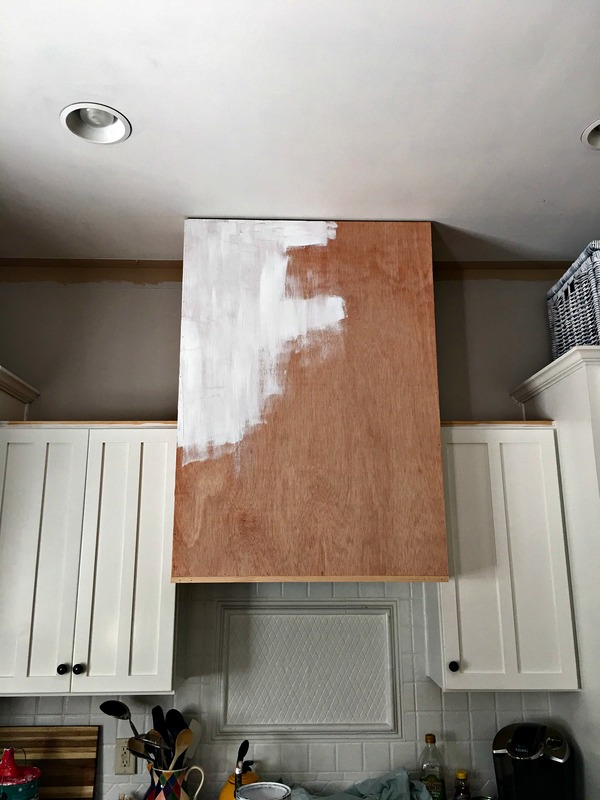 One of the projects awaiting us is a range hood. I have pinned dozens of them, + they all pretty much like yours. I shall put a platter on the shelf, btw. My spousal equiv, G.O., is like your Yankee. He can do anything that I dream of! Wishing we’d met when we were young! Anyway, good job, + TY for the additional inspiration! 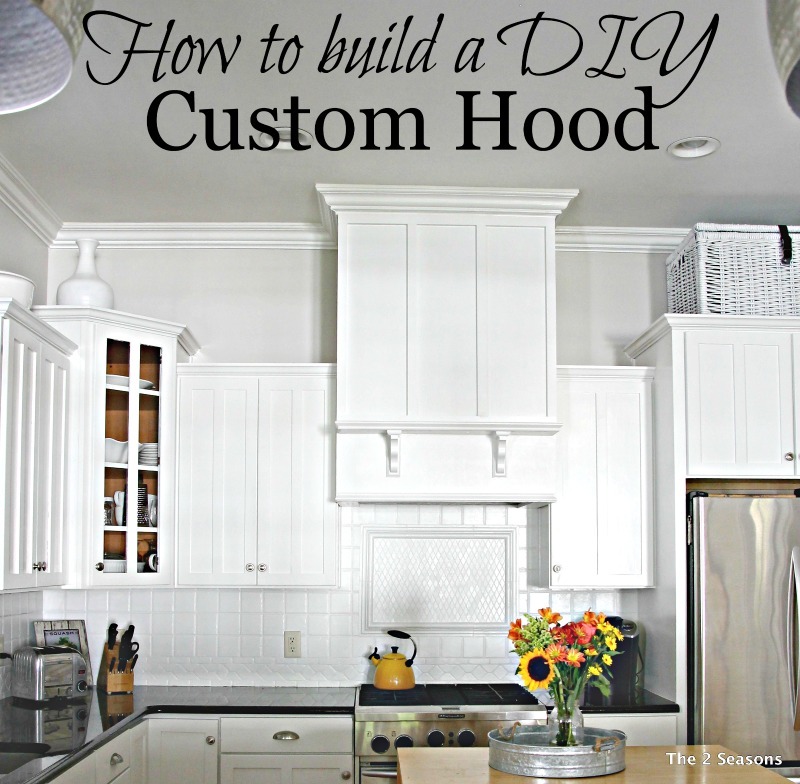 We pinned a lot of hoods for inspiration as well. LOVE Pinterest. That is wonderful you have your own Yankee he is already moved on to the next project and I can’t wait to share once it is finished. Good luck with the kitchen! I LOVE How Great your Kitchen looks. The balance is so important and you all nailed it!! Good job!! Beautiful! 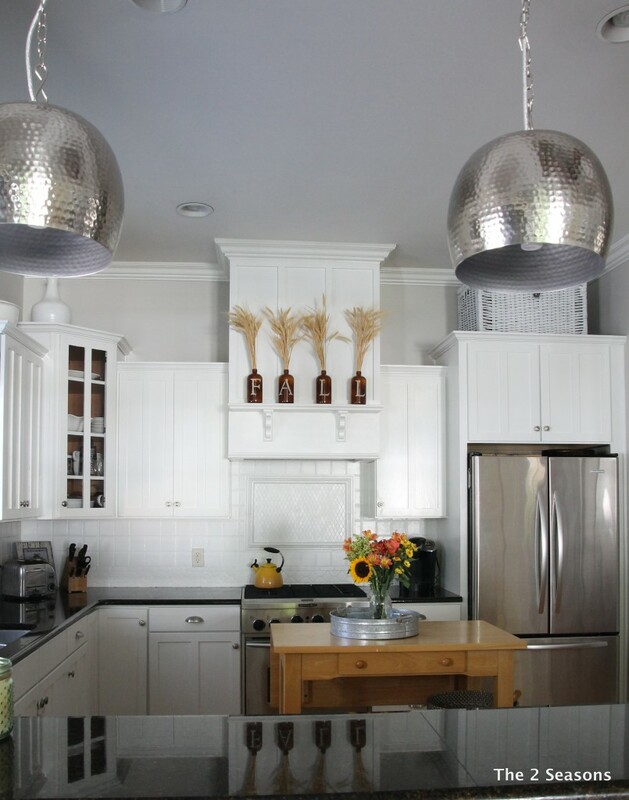 A great update for your kitchen. What a great job! It is just beautiful!! What a lucky gal you are to have your Yankee to do all your creative ideas. Love your kitchen, what a super update!! Looks great! LOVE the shelf! Way to go! You and Yankee did a great job!…the new hood is so beautiful!!! Like the way the shelving and stile molding broke up the heavy mass of the hood. Good design and execution! Thank you Teresia. I am about to put Christmas on those shelves. Thank you for the kind words. I go the pendants at Home Goods a few months ago. Here is a post I wrote about them and also some similar lights. 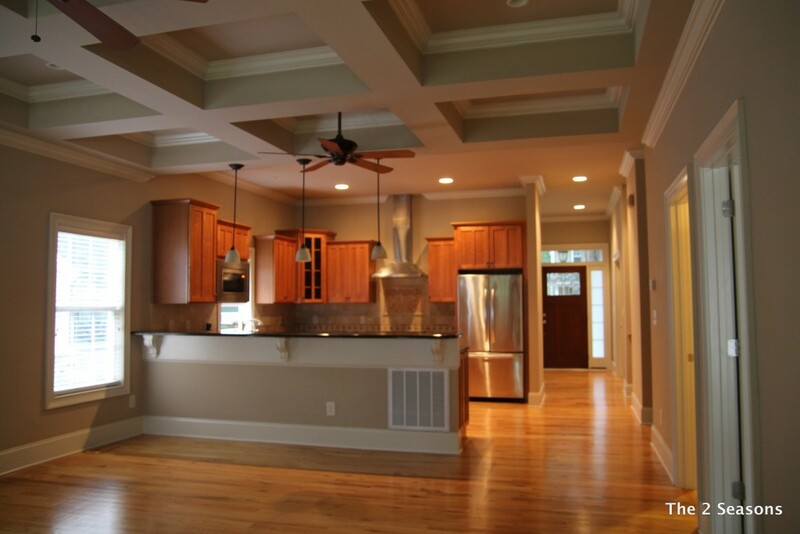 Hi…Beautiful kitchen. 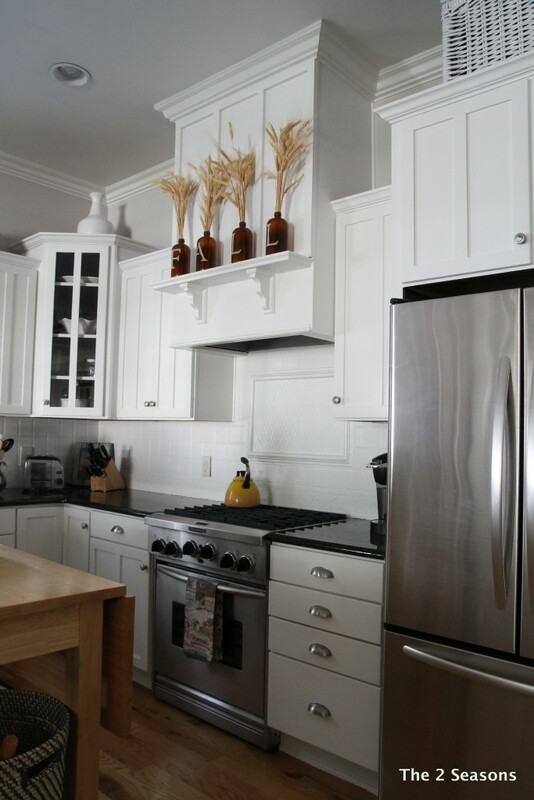 Love a white kitchen. 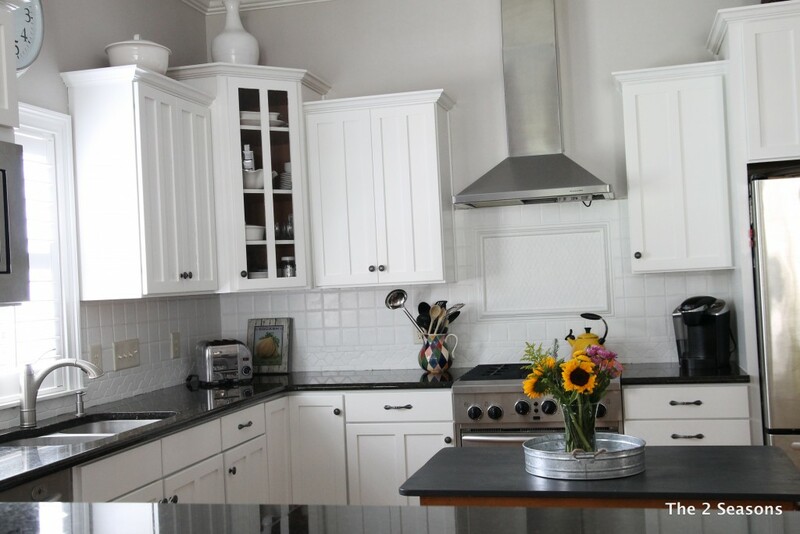 My question is the backsplash and framed design behind the stove appear in the before pictures as tan tile. In the finished pictures, the tile is white along with the framed design over stove. When did you change that out? Before building the new fan box or after ? Was that a big project to accomplish?